Constructed of commercial .16 gauge stainless steel, this is a hardworking, yet stylish kitchen sink. The sink is made with proprietary insulating “quite coat” technology, that reduces “splash back” sound, as wells as muffles the sound made from heavy pots and pans hitting against the sink walls. The zero edge side walls and a rounded bottom edge radius make the sink extremely easy to clean and because Black Stainless Steel is less reflective than traditional stainless steel, it resists fingerprints and water spots. As a design element, the black finish is sleek and edgy, while at the same time being sophisticated and luxurious depending on how it is paired with other materials. 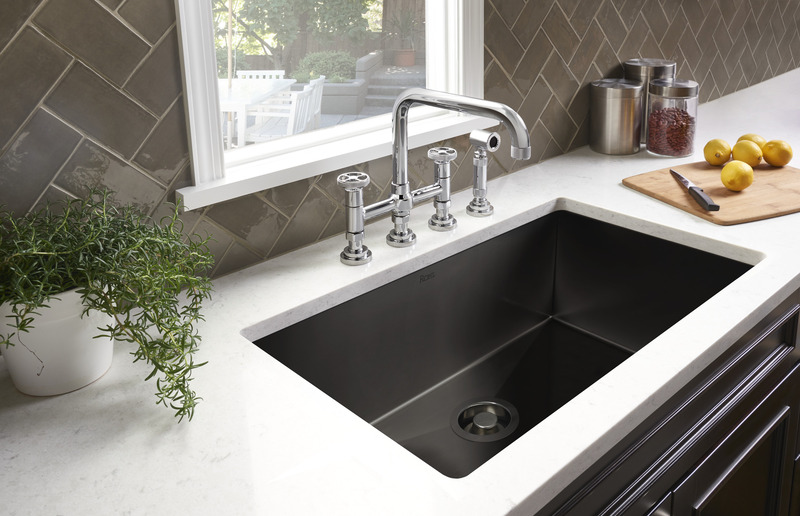 A Black Stainless Steel Sink paired with white cabinetry and countertops is a timeless pairing, but when paired with a faucet in the ROHL Italian Brass Finish, the combo is a showstopper. 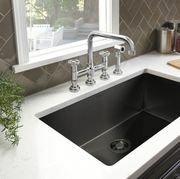 The new ROHL Luxury Italian Black Stainless Steel Sinks are available in four sizes, including kitchen and prep sinks. ROHL is introducing the new finish at the Kitchen & Bath Industry Show (KBIS), January 7-11, 2018, in Orlando, Florida.